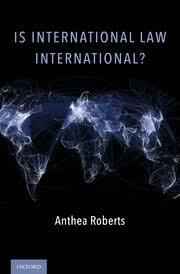 In this book, Professor Roberts takes us along as she chases the title’s question down an international law rabbit-hole to reveal a topsy-turvy world in which international law is parochial and the invisible college is rendered visible. Roberts turns a beguilingly simple question into a globe-trotting, multi-method quest for a map of international law’s players and meanings. Simultaneously irreverent and serious-minded, Roberts develops an original research agenda that takes her and the reader through the migratory flows of international lawyers around the world, the divergent methods through which they are educated, and the different professional tracks through which they are socialized. The book does not just dissolve international law’s myths of universality; it is a nascent sociology of the field of international law and the beginning of a new field of comparative international law. In an era in which Western dominance over international law no longer looks certain, this book provides the tools for a more nuanced understanding of international law’s politics, revealing the deeper meanings and stakes of current debates. To discuss the book’s findings and main claims, EJIL:Talk! and Opinio Juris have assembled a distinguished group of international lawyers from all over the world. The discussants on EJIL:Talk! will be Professors Hélène Ruiz Fabri (Max Planck Institute Luxembourg for Procedural Law) , Vera Rusinova (National Research University ‘The Higher School of Economics’, Moscow), Bing Bing Jia (Tsingua University, Beijing). On Opinio Juris, the discussants will be Professors Paul Stephan (University of Virginia), Julian Ku (Hofstra Law School) and Marko Milanovic (University of Nottingham). . We are grateful to all of them for taking part in this discussion.The symposium will open with a post later today on both blogs by Anthea introducing her book. Readers are invited to join the discussion with comments on the posts.